Ruins of a Crusader fortress, Khan and Arab village, located in a national forest south of Rosh Ha-Ayin. An aerial map of the area around the site is shown here, marked with the major points of interest. 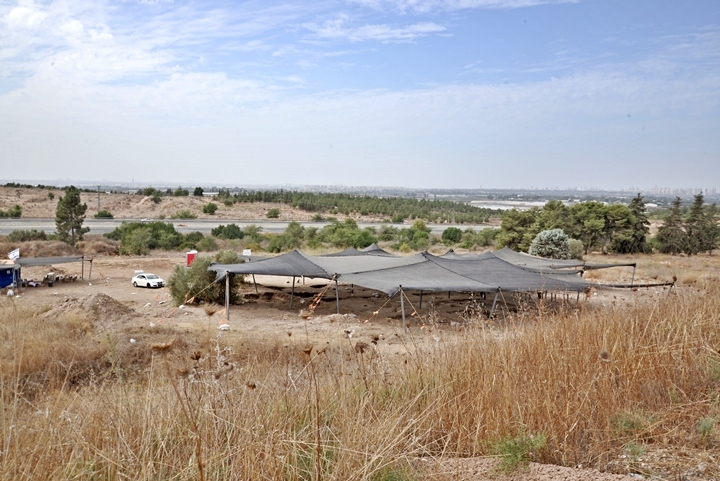 The site is located close to Road #6 (Israel's cross highway), but the access from road #444, south of Elad. The fortress and Khan is at 113m above sea level, while the ruins of the village are on higher altitudes (120-140m). The archaeological surveys and excavations of the area around Qula identified that the settlement in Qula was first constructed during the Chalcolithic period. 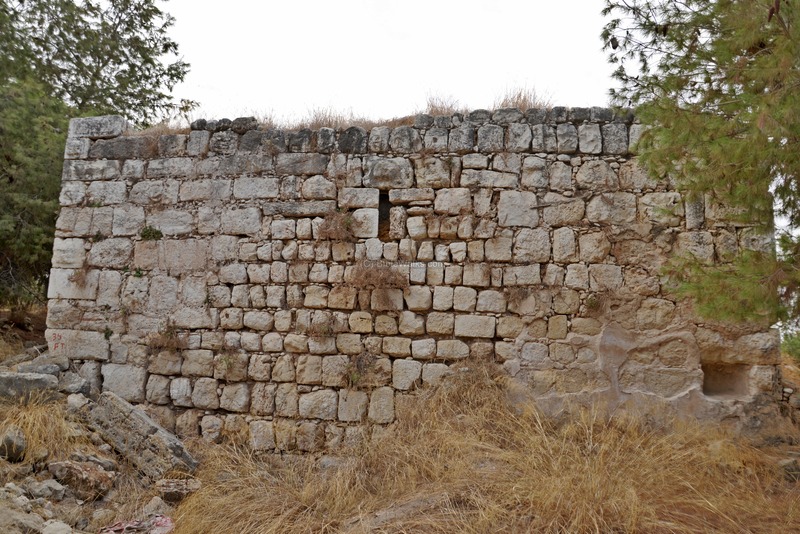 That early settlement was spread out in the hills around and under the ruins of the Arab village, south of Nahal Mazor (Wady Sahury). The area west of the ruins of the village was used throughout this period and later periods for farming, industry and burial (rock hewn tombs and burial caves). The settlement was located on the higher hill on the east, where the present ruins are located. Structures and ceramics were identified in the area around and under the ruins of the village, covering the periods from the Hellenistic period to the Roman/Byzantine periods. 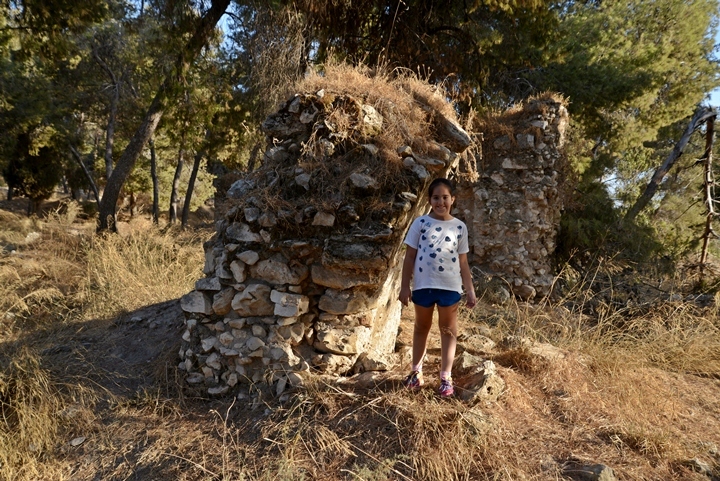 The area west of the village continued to be used for farming, industry and burial during these periods, while the center of the settlement was under the Arab village and in the area of the Qula forest. The cities and roads during the Israelite and Hellenistic and Roman periods are indicated on the Biblical Map below. 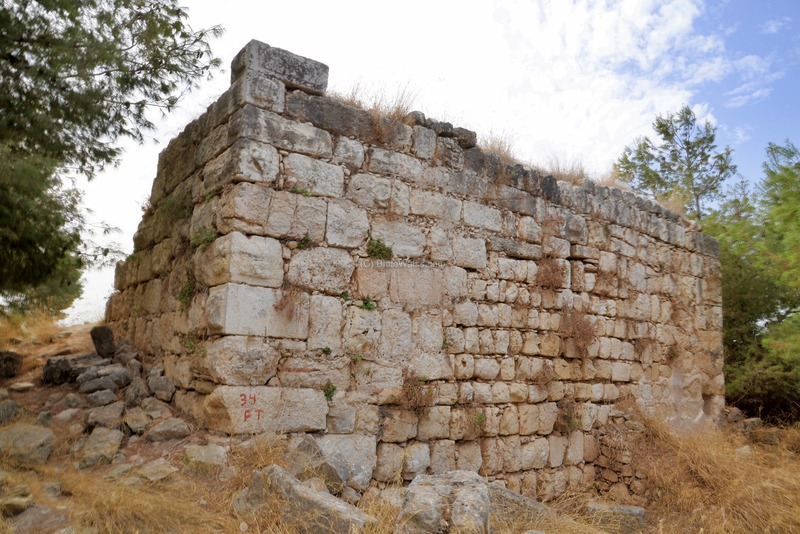 The main city of Afek/Antipatris is to the north west of Qula, where the major ancient route (Via Maris- way of the Sea) passed near it, going south to Lod (Lydda). Qula, marked by a red square, was located near the road going towards Jerusalem, south east of Afek. The Crusaders arrived from Europe to the Holy Land in order to liberate the Holy Land and free Jerusalem. They accomplished the mission in 1099, and established the Crusader Kingdom. Then they began to construct fortresses along the borders, ports and main roads. Qula was one of these fortresses along an important central route. The Hospitallers order: Monks from the Benedictine order (Order of St Benedict) tended the sick and wounded warriors in Jerusalem. This group evolved into a new local group that combined the religious zeal together with the Crusaders military life. The order, officially established in 1113, named their order after John the Baptist, and were called the "Knights Hospitallers of St. John", or commonly known as the Hospitallers. At the 11th Century they purchased and renovated a church and monastery of St John the Baptist, and their living quarters and the hospital structures were located near the Sepulcher Church. This order, as other Crusader military orders, became powerful and well financed. They purchased lands and castles from landowners who were in financial trouble. In 1181 the Hospitallers built a central administration center in Qula. It was named Kola (or Cola). The center included a tower and vaulted structure. Kola was one of the relay stations built across the Crusader Kingdom using fire signals. It was destroyed by the Ayyubid 6 years later. The tide against the Crusaders turned after 5 years when Saladin's forces defeated the Crusaders in the decisive battle of Hittim (July 4, 1187). Following this victory, Salah ad-Din captured most of the Crusaders Kingdom in that year, including Qula. 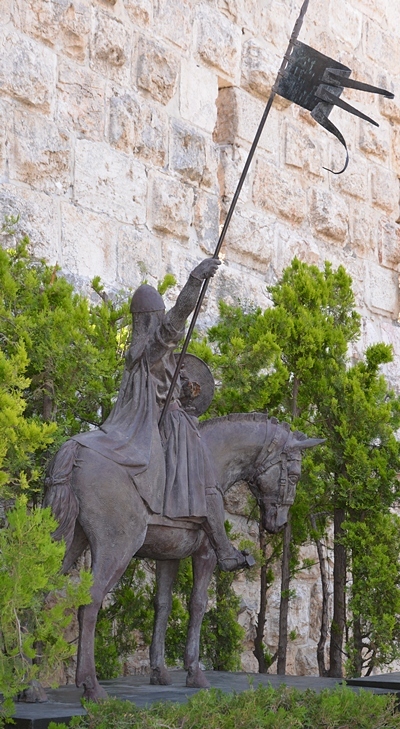 The Crusaders launched a third Crusade (1189-1192) to regain the Holy Land, and in 1191 Richard Lion-Heart captured most of the coast line, Jerusalem and parts of the Galilee. According to the truce agreements of 1198 and 1229, the Crusaders held the area of Qula which was a station along the road to Jerusalem. Due to the weakness of the Crusader Kingdom, they were pushed back to the coastline areas in 1244-1254. The Mamelukes were Turkish prisoners of the Mongols who were sold to the Sultan of Egypt, trained by him and served as his palace guards. In 1250 the Mamelukes, headed by , headed by Bybars, seized the control of Egypt, and defeated the Mongols (1260). In the years 1263 to 1271 the Mamelukes captured most of the remaining Crusaders territories in the Holy Land. They pushed the Crusaders out from the coastline areas by 1266. The fortress of Qula was abandoned and destroyed. The Crusader Kingdom was finally defeated in August 1291. An Arab village was built on the highest hill, which today is covered by a forest. 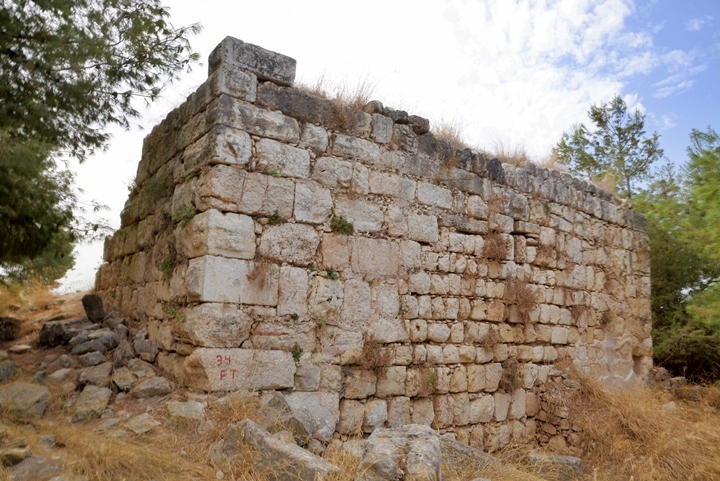 It was built over the earlier layers, reusing the Roman and Byzantine period structures and building blocks. Their houses also incorporated the cisterns and installations. The Crusader fortress was turned into a Khan (Caravansary). Conder and Kitchener surveyed this area during the Survey of Western Palestine (SWP) in 1873. A section of the survey's map, part of Sheet 14, is shown below. "Kuleh - This village includes some well-built structures. ; the door on the south has a pointed arch and a tunnel vaulting. is called Burj Kuleh. There is a birkeh, about 20 feet square, and 6 feet or 8 feet deep, lined with good cement ; it is called Birket er Ribba. These remains have the appearance of Crusading work, and the name, Neby Yahyah, close by, points also to former Christian occupation of the place. Qula was the birth place of Hassan Salameh, a, Arab leader of the gangs during the 1936 riots. 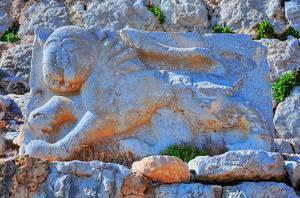 He was killed during the Independence war of 1948 in the battles around Rosh Ha'Ayin. His son, also born in Qula, was a senior Fatah commander of the Black September unit and the founder of Force 17. During the Independence war, the town was conquered as part of Operation Danny in an effort to expand the controlled area around Ramla and Lod. A nearby monument is located south west of the site, commemorating a battle on July 15, 1948, when Jordanian forces with tanks forced into the conquered town and killed 28 Jewish soldiers of the Alexandroni (3rd) Brigade. The village returned to the Israeli control on July 18. 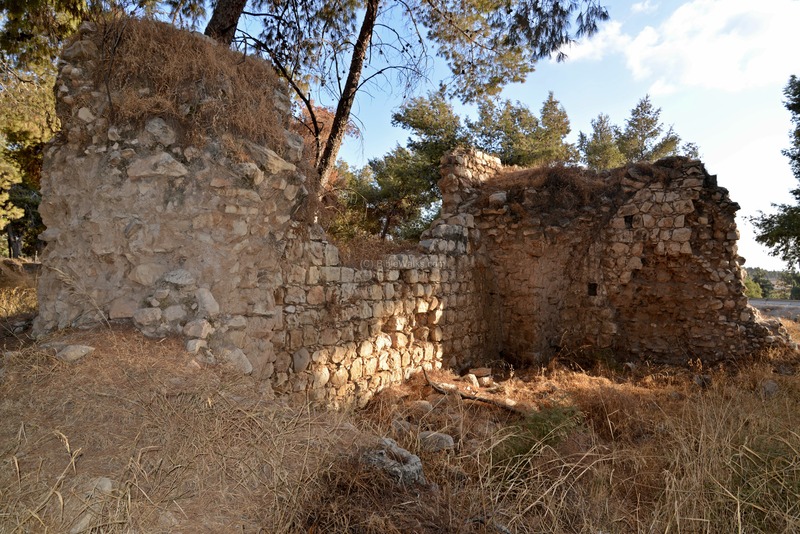 A nearby Moshav settlement of Giv'at Ko'ach was established in 1950, commemorating by its name (meaning the hill of the 28) the tragic battle of Qula. The town was destroyed during and after the war, and only remains of the fortress and bases of some structures can be seen today. Today the site is open free to the public. It is on the side of the main road #444 from Elad to Shoham, and is easily accessible. You can combine a short visit to the site with a hike or picnic in the National park of Kuleh, and visit the remains of its Crusaders fortress. 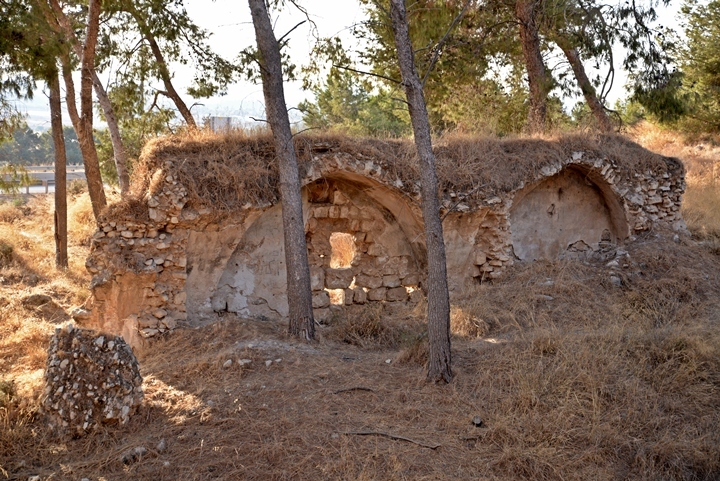 A national forest was planted by KKL (Keren Kayemeth Le'Israel - Jewish National Fund) around the ruins. 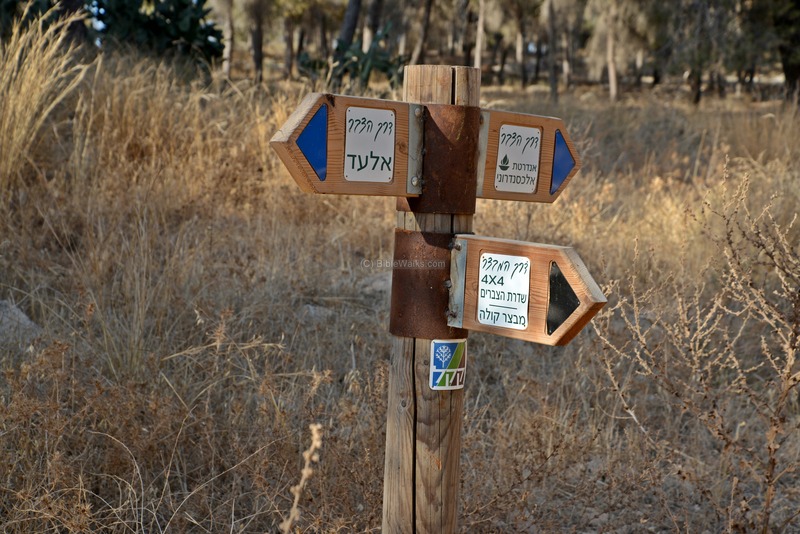 Since 1901 KKL planted trees and developing communities throughout the country, converting many areas in Israel from barren landscapes to green areas. 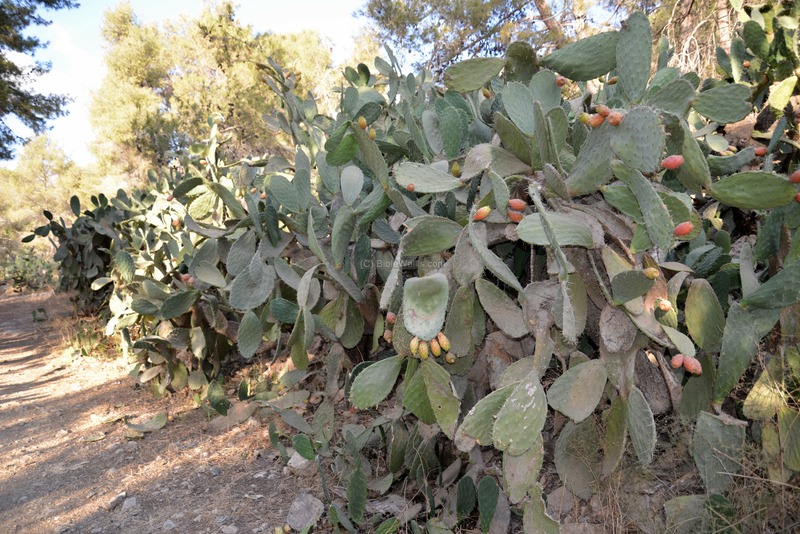 The Qula forest is a great place for picnics, social gathering and hiking. This photo is a view of the forest on the north west side of the village. The road on the right ascends towards the fortress, passing the ruins of the village on its lower west side. 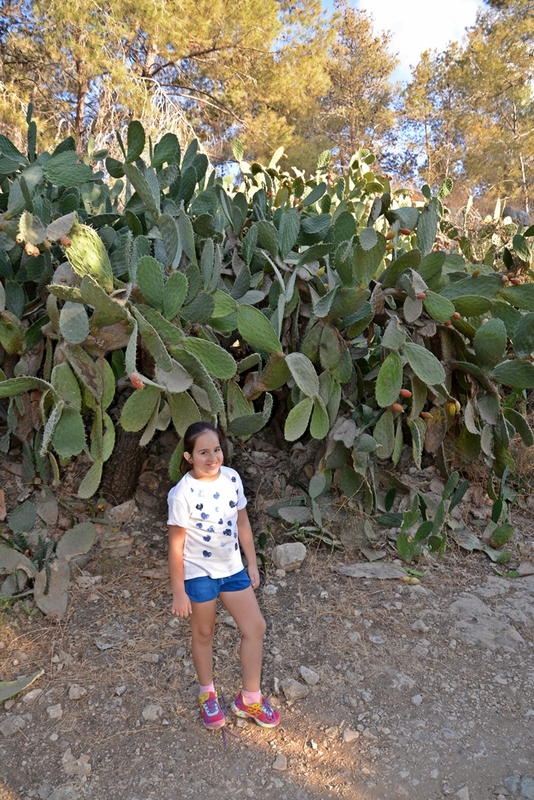 Niece Yarden, here on the side of the road, joined this hike. Although there was a short climb up to the summit on the south west side, she enjoyed the walk. Signs (in Hebrew) provide directions to the ruins of the fortress and village (lower right sign, indicating access by foot or by 4x4 vehicles), to El'ad (left sign) and to the Alexandroni monument (upper right sign). 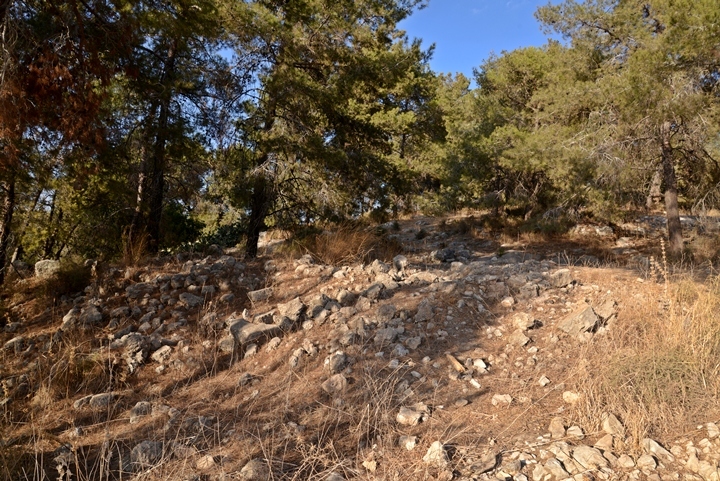 Sections of the ruined village of Kuleh can be seen along the road ascending up towards the fortress. The cactus bush on the side of the road was a typical fence used in ancient villages. Between the cactus bushes and the pine trees are ruins of the Arab village and installations from earlier periods. Between the woods of the forest, on the west side of the village, are several standing walls that remained from the ruined Crusader fortress and the Khan. A new excavation was started in 2015 on the west side of road #444, west of the Crusader tower. At this time, we have no additional details on this excavation. 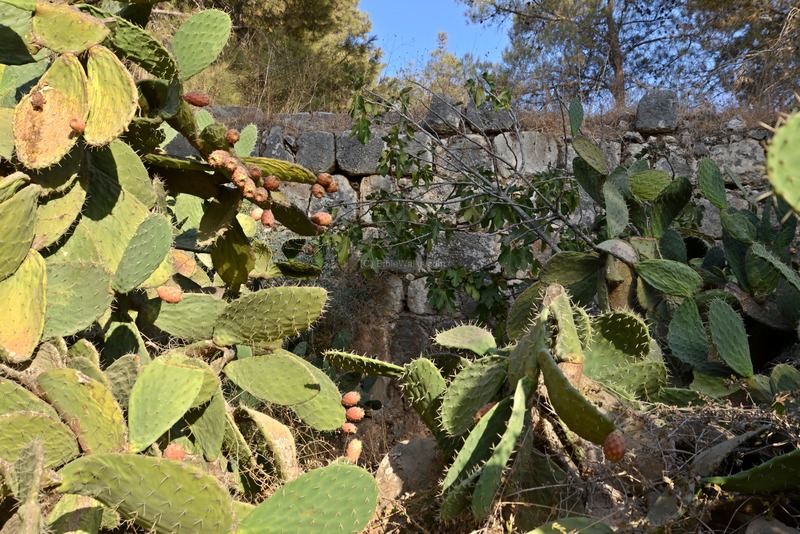 Cactuses (Cacti) line the edges of Arab village roads and houses, as they provide a natural fence that protected the villagers. 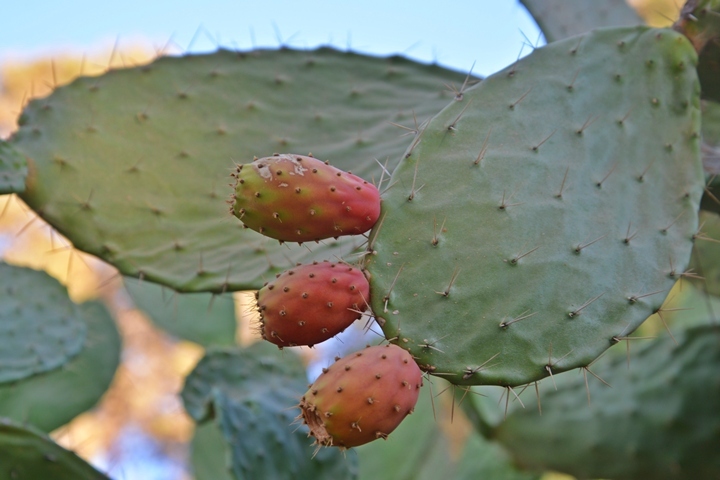 A closer look on the juicy cactus fruits is below. This photograph was taken in the last week of September. 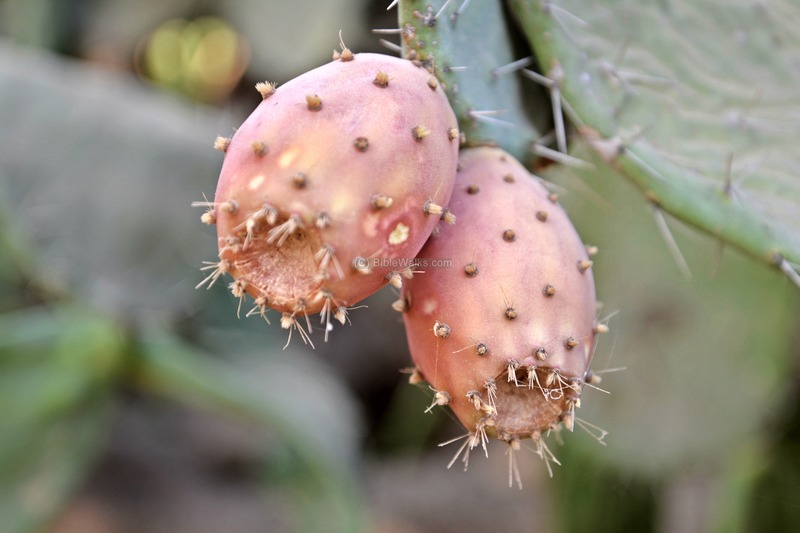 You can pick the sweet fruits (aka Sabre)- but beware of these tiny thorns. 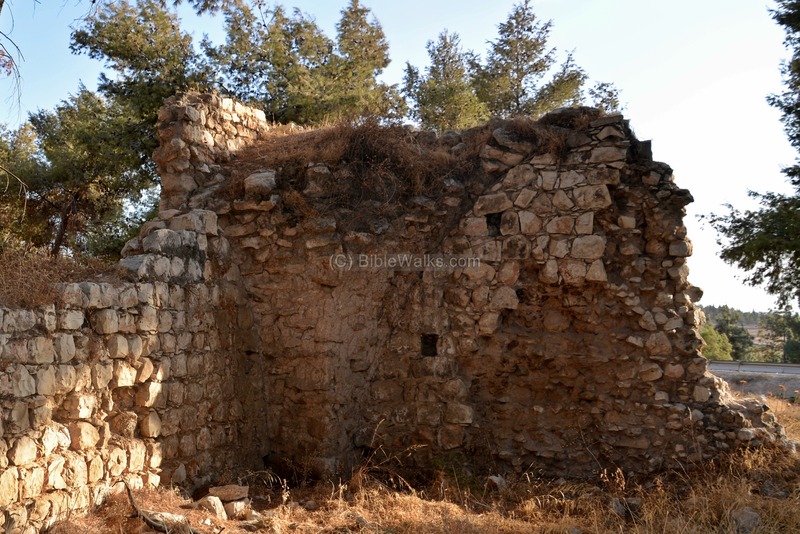 el Mezeirah - the ruins are located in the center of Elad. Arabic: "The sown lands" [PEF names, p.239]. 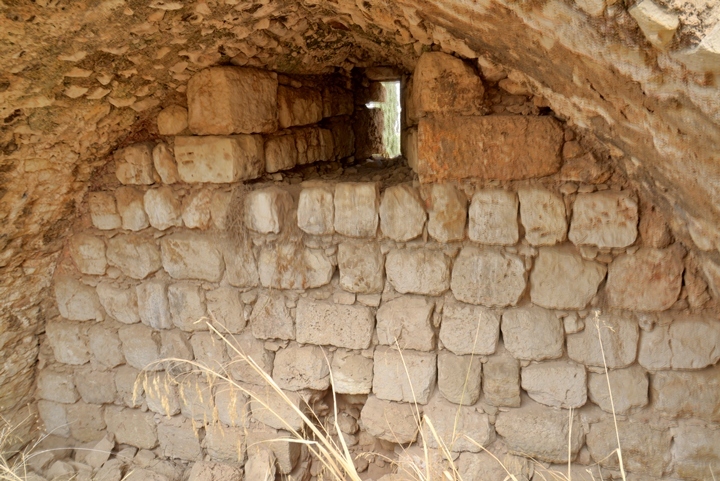 Mazor - Moshav west of the site. Hebrew: Cure, based on the name of the nearby village Mezeirah. El'ad - Religious communal settlement east and north of the site, established 1990. Biblical reference (1 Chronicles 7:20-211): "And the sons of Ephraim...And Zabad his son, and Shuthelah his son, and Ezer, and Elead, whom the men of Gath that were born in that land slew, because they came down to take away their cattle".